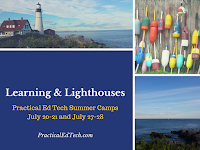 The first of this year's two Practical Ed Tech Summer Camps is just six weeks away. Group discounts are still available to school districts that are sending four or more people. A group of four can save $600 when they register together compared to the standard registration. Registration for the Practical Ed Tech Summer Camps includes 16 hours of hands-on professional development in small groups. Breakfast and lunch is included both days. Practical Ed Tech BYOD Camp - Save $600 or more when you register a group! Practical Ed Tech Chromebook Camp - Save up to $2000 when you register a group!